Parsley practically grows wild in the Veneto region of Italy. That is probably why my mother always has a glass jar of it already washed and chopped in the fridge, waiting to be used. She includes some of the finer parts of the stalks too. The parsley we use is flat leaf (or Italian) parsley (rather than curly leaf), which is a native of the mediterranean lands and grows easily in a pot on your terrace (making it perfect for inner city dwellers). 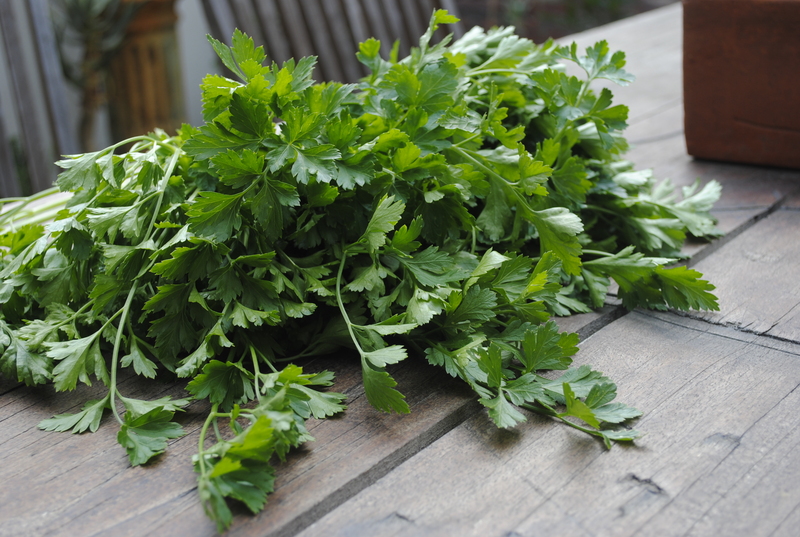 Parsley goes with most italian dishes. I even make Basil pesto with some parsley. I scatter it on risotto, on pasta, on some soups and put it in omelettes. It is great when chopped finely and mixed with finely chopped garlic and lemon zest to make gremolata (which is gorgeous scattered on osso buco or lamb). A few weeks ago I picked armfuls of it and decided to make salsa verde with it. Salsa verde sounds quite romantic in Italian but it translates to ….. green sauce (which does not sound nearly as appealing). However this delightful bright green sauce is very simple to make and is fresh and tasty on so many types of food, particularly roasted meats or deep sea fish like tuna – it almost tastes green to me. It is a great sauce to have up your sleeve when you have guests coming over. It keeps for a week in the fridge if you cover it with a layer of olive oil so you can keep it for use at a later date. My husband likes it on a bit of fresh bread while he is waiting for dinner to be ready. I have even heard of some people freezing it for a few months (though I have not tried it myself). It is a bit like pesto but there are some major differences. The addition of a bit of vinegar and capers means that it is fresh tasting (rather than the richness of pesto). Put all the ingredients in a small food processor and pulse until it is the desired consistency. I like mine a bit chunky so I don’t pulse it much. Taste to see if you think it needs more salt. I found that the anchovies and capers were sufficiently salty. My recipe is adapted from Lucio Galletto’s recipe, though I changed the quantities to suit my taste.